Dr. Ami H. Shah has graduated as Bachelor of Engineering in Civil Engg. from DDIT, Nadiad in year 1996. She has completed her post graduation with Master of Technology in Remote Sensing from IIT Bombay in the year 2004. She was awarded with the degree of Doctorate of Philosophy in Transportation Engineering from IIT Roorkee in 2011. She got first rank in the discipline and institute with 9.84 CPI in M.Tech at IIT-Bombay. She has professional experience including 20 years of teaching and research and 2 years of working with industry. 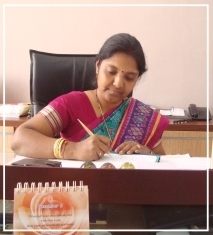 She has worked for 8 years with SVIT, Vasad. She has published more than 15 national/ international journals and national/ international technical papers in conference proceedings. She has been heading the insitution since February 2011. She was awarded with best teacher award. She has visited different countries such as China, Singapore, USA and Hong Kong.